BI>Jungle hospitality, one of the thing's Cayo is known for, is one of the focuses of this superbly written article from Jaxfax magazine. Chaa Creek and Hidden Valley Inn are highlighted, of course, and Caracol, ATM, Butterfly Falls, and the San Antonio Women's Group classes are recommended. Well worth a read. Belize offers two realities: Jungles where you can hear the roar of howler monkeys and stay in rooms that make you feel like you’re at luxury summer camp - where you can disconnect from 24-hour media and other noise pollution, and the glowing aqua shore where you can lean against palm trees on a beach that retains its wild outlines and enjoy a pina colada. 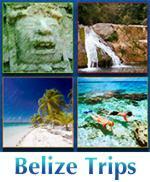 Belize offers both those experiences. Start in the jungle with rigorous hiking, biking, swimming, bird watching and other activities and end the trip with relaxation, snorkeling, a fishing excursion perhaps or a trip to a high-end spa. You can begin your tour of Chaa Creek’s 365 acres by exploring the medicine trail with a guide. On the way there, don’t be surprised if you pass a large iguana roaming the lawn, and gardens where fragrant oregano grows and a papaya tree is in bloom. The guide will explain how coffee trees were used to reduce fever in a child and the Spanish elder tree could treat insomnia or a toothache. From the Mayan medicine trail, it is a short walk to the resort’s Blue Morpho Butterfly farm, where these insects can be observed from all stages of their development, from pupa to fully-formed and in flight. The nature education, ideal for families with children, can be continued in the early evening with a Creatures of the Night tour. Tiny spiders, with bodies so small they can’t be seen, reveal themselves with eyes glowing in the grass while larger spiders build impressive webs overhead and Leafcutter Ants march in formation. Your guide will also probably nudge a Mexican Red-Rump tarantula out of its hole in the ground. Centipedes and millipedes also will likely make an appearance. Jaguars, which live in Belize, also make the rain forest jungle their home, but as JAX FAX’s guide explained, they will see you, but you probably won’t see them. Situated on a 7,300 acre reserve in the Maya Mountains is Hidden Valley Inn and Preserve. Located in Mountain Pine Ridge Cayo, Belize, the resort’s 93 miles of maintained hiking trails are ideal for bird watching, hiking, biking and swimming. The preserve boasts 5 major waterfalls, including one the the tallest in Latin America. Secret Falls (shown on the cover of this issue) offers couples a private romantic lunch and afternoon alone in this pristine wilderness. The Inn itself is comprised of a main lodge with six outlying cottages, with 2 units each. Rooms are elegantly simple with working fireplaces, fireside sitting area, king or queen bed and desk area. There are screened windows and ceiling fans, but no air conditioning as it is not necessary. Wifi is available throughout the property. Meals are served in the main lodge and the bar becomes a focal point at night, where guests share their adventures of the day. Other amenities include a pool and hot tub, a private airstrip and over the river yoga platforms. Hidden Valley Inn is a great jumping off point for a variety of day excursions. The area near Hidden Valley offers the chance to sample the local Mayan culture. The San Antonio Women’s Group, located less than a half-hour from the resort, in the town of San Antonio, gives some of the area’s native women a chance to earn a living, and provide an educational experience about their culture. Visitors can observe (and partake in) traditional Mayan cooking, and watch how Mayans sculpt pottery and embroider clothing. No trip to the Hidden Valley Inn area would be complete without a visit to the Caracol Mayan Ruins, located just under two hours by car, from the resort. JAX FAX got an extra treat at the entrance of the site where a family of Howler Monkeys lining a treetop howled in competition with a friendly Pit Bull dog. A thorough tour of Caracol requires physical fitness and stamina as the main structure has 98 very steep steps to climb to the top. The effort is worth it, since a knowledgeable guide can point out facts about each level. Visitors can see where Mayan leaders lived near the bottom of the structure and the ceremonial uses of the areas near the top. Beyond this main structure, the site has excavated spots that were used for religious sacrifices and ancient games. One of the secondary structures is thought to have been an observatory for ancient Mayan astronomers. Belize is famous for its caves and several are within an hour of Hidden Valley. JAX FAX opted to visit the famous ATM cave. The entrance to this cave requires a 25 yard swim into the cave. From there, you proceed through ankle to waist deep water for about one mile. At this point, an easy scramble up a level brings you to an area strewn with ancient Mayan pottery, firepits and 14 skeletal remains, including the Crystal maiden, an intact crystallized young woman’s skeleton. The cave is not for the claustrophobic, as the return trip involves some tight squeezes through water filled tunnels. Nonetheless, it is an experience not to be missed. 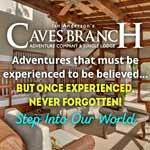 For those who prefer to stay dry while caving, nearby Barton Creek Cave offers the opportunity to canoe through a cave system. Another physically taxing activity well worth the effort is a hike up to Butterfly Falls, located on the Hidden Valley Preserve. The trek is rigorous enough that hikers are offered walking sticks at the outset. Shoes with strong traction are necessary as the trail is often uphill and frequently requires sidestepping rocks and the many tree roots that jut out in the middle of the path. After hiking for what feels like about an hour, there is a rich reward - a pool made by the falls that is the perfect swimming hole. The clear water is chilly, but only enough to be refreshing. The pool JAX FAX visited and swam in was up to 15 feet deep and wider than most suburban swimming pools. The falls cascade around rocks at the back of the pool and the water is calm and clear enough to see your body under water. It has a blue sheen from afar. An experienced world traveler on the trip said it was possibly his best swimming experience ever. Several days in the jungle requires a respite. The perfect place for that rest and relaxation is a luxury resort on the coast. JAX FAX traveled by air to San Pedro Airstrip at Ambergris Caye. 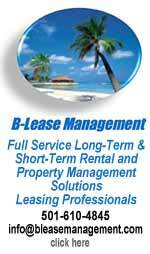 This island is the most developed of all the Belizean cayes but still retains its Latin American/Caribbean charm. Gone are the sand covered streets JAX FAX first encountered here 15 years ago, now paved with cobblestone, but golf carts still trump cars as the preferred method of transportation. The airstrip on Ambergris Caye is located in the middle of the town of San Pedro and right across the street is the Sunbreeze Beach Hotel. It would be hard to find a more convenient location with the airport across the street, the beach as its back yard and shops and restaurants just a short walk away up the beach. This intimate hotel features 43 air conditioned rooms, most with ocean view, a freshwater pool, bar and restaurant. Its sister property, the Sunbreeze Suites is located on the northern edge of downtown San Pedro and features twenty one-bedroom vacation suites with living rooms, full kitchens and balconies overlooking the beach. A beachfront fresh water pool is the perfect place to watch fisherman clean their daily catch on the pier in front of the hotel, while stings rays circle their feet. 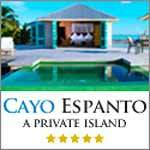 A half-hour boat ride north up the coast of Ambergris is El Secreto Hotel. El Secreto’s beach is still unpopulated and wild enough that you feel like you’ve just happened by chance on a tropical paradise. The beach retains a natural scattering of palm trees that create a canopy overhead. Ample lounge chairs and hammocks persuade you to linger there. A trip to the resort’s spa for a massage will put you fully in mode relaxation. Unlike Chaa Creek and Hidden Valley Inn in Belize’s jungle, the rooms, or individual villas, at El Secreto are high tech. Guests are given iPods programmed to control all the functions of their villas, from lighting to air conditioning. Each device also is loaded with a wide range of music that plays on speakers camouflaged to blend into the villas’ thatched roofs. JAX FAX stayed in one of the resort’s Sea Villas, which is so literally “on the beach,” that you step from the sand of the beach into the villa. A highlight of these villas are the both indoor, as well as outdoor showers, but the outdoor shower is not for the modest as it is thinly shielded from walking paths by a wood slat wall. But that’s the charm of El Secreto. The resort seems to strive for an open, laid-back, “bare foot luxury” experience. A trip to Ambergris wouldn’t be complete without time spent on the water. About a 20-minute boat ride from the resort’s dock takes you to the Hol Chan Marine Reserve and Shark Ray Alley, where snorkelers get a view of Belize’s barrier coral reef, along with sea turtles, sting rays, nurse sharks and numerous other forms of aquatic life. JAX FAX’s snorkeling adventure unveiled multiple large sting rays, at least one sea turtle and many iridescent tropical fish. Lured with bait, throngs of nurse sharks, harmless to humans, swarm. 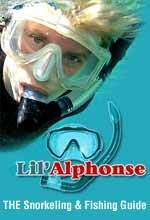 You can jump in side-by-side with the sharks and use your snorkel to get a view of the mechanics of their swimming. 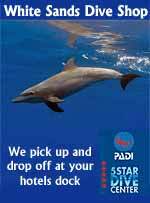 Your guide may even hold one of the sharks up to pet. Like so much of Belize, it’s a beautiful, tactile experience. If your clients enjoy flats fishing, the shallows off the western side of the Caye are sure to please. JAX FAX went out for a half day excursion with expert fishing guide, Aby Marin of Go Fish Belize (www.gofishbelize.com). Aby offered a choice of flyfishing or spinning and the latter was selected. After a quick stop to seine for bait, we made about 6 stops at various fishing holes and each produced the promised species including yellowtail, barracuda and tarpon. No bonefish or permit on this trip, but it will be a pleasure to return and try again. JAX FAX flew on Avianca Airlines nonstop from New York’s John F. Kennedy International Airport to El Salvador International Airport in San Salvador, El Salvador. From there, a connection was made to Belize City, Belize. The plane seemed to be brand new with leather seats, individual television sets and enough legroom that even a middle seat in coach was bearable. Once in Belize, local airlines Maya Air or Tropic Air provide frequent flights throughout the country, the longest taking no more than an hour. 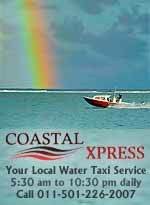 While in Belize JAX FAX stayed in the Cayo District and Ambergris Caye. In Cayo JAX FAX stayed at both the Chaa Creek Resort (www.chaacreek.com) and Hidden Valley Inn. 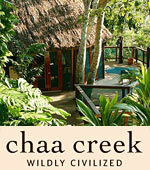 At Chaa Creek the individual cottages have thatched roofs and screened windows. Air is circulated by a strong ceiling fan. The resort’s 365 acres includes a swimming pool and trails where a guide can teach you about traditional Mayan medicines and the animals and insects that live there. The resort’s Blue Morpho Butterfly Farm allows you to see the insects from the earliest stages of their development to seeing the butterflies in flight. Hidden Valley Inn (www.hiddenvalleyinn.com), located in Mountain Pine Ridge Cayo, Belize, has 7,290 acres to explore. You can hike, bike, swim or bird watch, to name just a few of the activities you can partake in. Individual cottages do not have air conditioning but are outfitted with screens and a ceiling fan. El Secreto (www.elsecretobelize.com), a luxury resort located about a 20-minute boat ride from San Pedro, Belize, features individual high-tech, thatched roof villas equipped with WI-FI, high-definition TV and air conditioning. Each room comes with an iPod that controls everything from the lighting to the air conditioner. Each of these devices also is loaded with a wide range of music that plays out of speakers camouflaged to match the thatched roof. Extras that come with each room include a pillow menu for guests to choose nearly any kind of pillow that suits them, from down to synthetic. Sunbreeze Beach Hotel (www.sunbreeze.net) enjoys a convenient location and provides a great jumping off point for aquatic activities while the Sunbreeze Suites (www.sunbreezesuites.com) enjoys an in-town yet beachfront location with fully equipped one bedroom suites. When to Visit: May to November is the rainy season in Belize (the country features rain forest lands, after all), so if you visit at the tail end of the rainy season, you may find activities like canoeing and cave exploration impacted. Weather: It was comfortably warm during the day when JAX FAX visited at the end of October/early November. At least some, if not many, of the hotels in Belize in the jungle or rain forest portion of the country take an all-natural, eco-conscious approach that involves no air conditioning, favoring instead rooms with only screens for windows and a strong ceiling fan. What to Pack: Shorts, short-sleeve tops, a rain poncho and small umbrella, trekking shoes (sneakers or boots with good traction to allow you to hike in the rain forest), long pants for exploring the rain forest, sweater, sunscreen for both your face and body (not forgetting to apply sunscreen to behind your ears and the back of your legs when snorkeling), polarized (anti-glare) sunglasses, sun hat or visor, binoculars for bird watching and insect repellent (even upscale hotels often are not able to keep out the many and varied insects Belize is home to). Mosquitoes can be a problem. 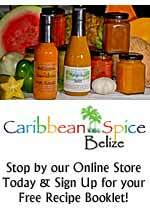 Language and currency: English is the official language of Belize, but many you will meet only speak Spanish. Nevertheless, an English-only speaker should be able to get by easily. US dollars and credit and debit cards are accepted, so no need to change currency. The Kind of Trip You Can Expect: Belize, whether in the rain forest jungle or on the beach, offers a back-to-nature experience. The most luxurious hotels often, as noted, do not have air conditioning and there often is no television, wireless access, or other modern media. The beaches are perfect for the traveler who wants to relax and disconnect from an over-stimulated life. Those in search of a beachfront with high-rise luxury hotels, a boardwalk and many bars and clubs for partying and many places to shop will be disappointed. Many of the beach resorts are accessible only by boat, so guests are mostly restricted to the restaurant, bar, spa and other amenities of the hotel. Some of these resorts have complimentary boats that can take guests to other nearby areas of the waterfront, but it’s best to make sure the beach resort you plan to stay in is luxuriously self-contained. 2 registered members (elbert, 1 invisible), 243 guests, and 7 spiders.